In our podcast on the South Street Seaport, we forgot to mention a very interesting little landmark to the area — the Titanic Memorial, a 60-foot white lighthouse that sits in the little plaza at Fulton and Water Streets. The Titanic sank on April 15, 1912, killing more than 1,500 people from all social classes. The loss shook society to its core. Among the victims were prominent New York businessmen and benefactors such as John Jacob Astor IV and Benjamin Guggenheim. As New Yorkers mourned the loss of loved ones, they immediately funneled their grief into the building of memorials, the physical remembrance of a disaster that left virtually no trace behind. The lighthouse memorial was dedicated on the first anniversary of the disaster with many family and friends of victims in attendance. Meanwhile, there were other Titanic memorials being planned in other parts of the city. In Greenwich Village, in the Washington Square studios of Gertrude Vanderbilt Whitney, the artist began work on a sculpture for a national memorial in Washington D.C.
Whitney’s triumphant statue –of a figure with arms outstretched (not unlike Kate Winslet’s pose in the film Titanic) — was completed in 1918 but not installed in Washington until 1930 due to waterfront construction delays. Yet another Titanic memorial was planned in June 1912 to honor philanthropists Isador and Ida Straus near their home on the Upper West Side. 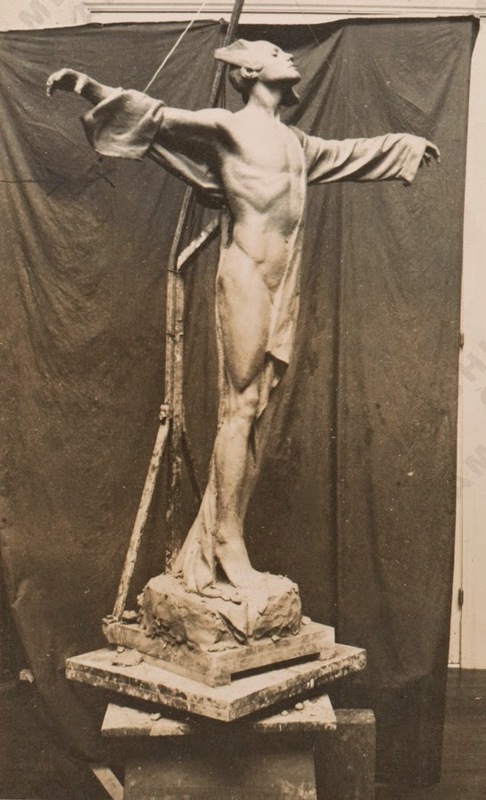 A competition was held in 1913 for aspiring sculptors, with Augustus Lukeman’s pondering nymph the eventual winner. 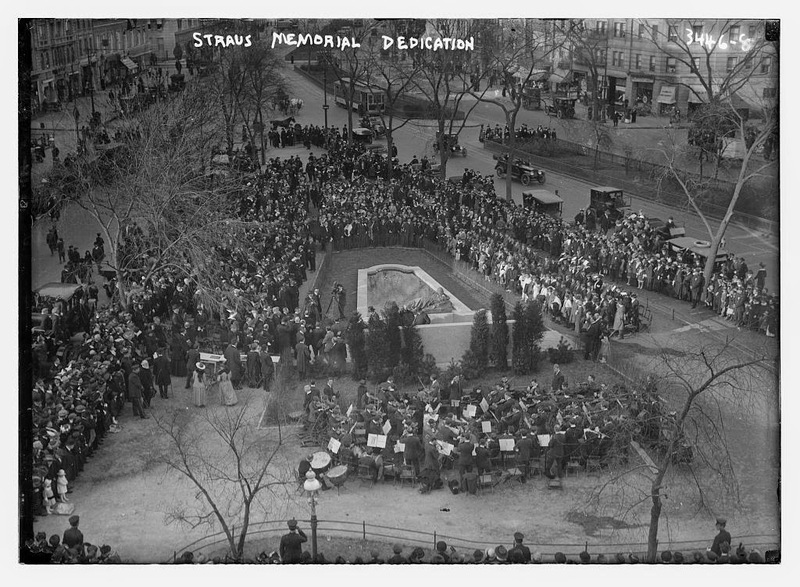 The statue and the newly named Straus Park were formally dedicated on April 15, 1915. Featured at the dedication ceremony were 800 children who had been helped by Straus’ Educational Alliance in the Lower East Side. As for the Titanic Lighthouse Memorial? 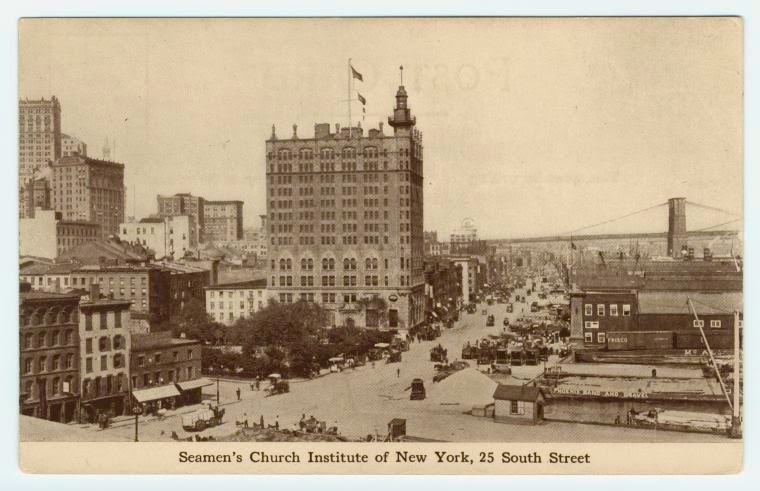 It sat dutifully atop the Seamen’s Institute for decades, its green light a welcome beacon to those entering the harbor. By the 1950s, shipping no longer came through the area of New York’s waterfront, and the Institute eventually sold its building. 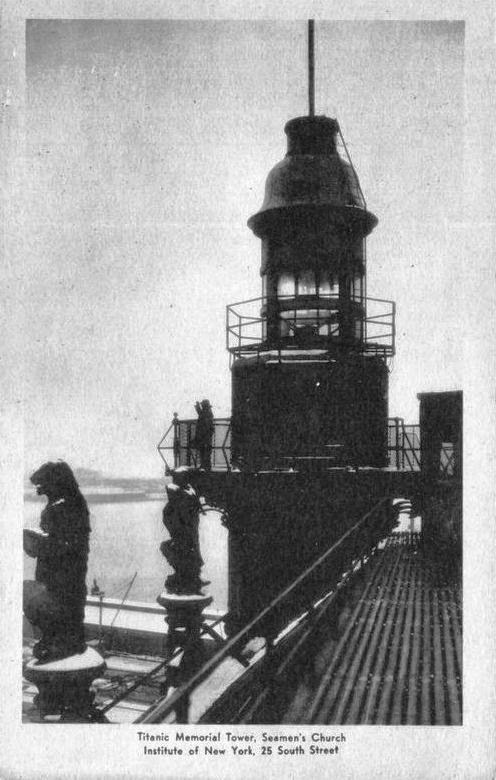 The lighthouse was donated to the South Street Seaport Museum in 1968, then a budding institution formed just a couple years prior to protect the historic structures of the area. For a time, the lighthouse actually sat on the waterfront before relocating back to its present home in 1976, in a park partially funded by Exxon Oil. There was one other memorial to the Titanic disaster — the Wireless Operators Memorial at Battery Park. 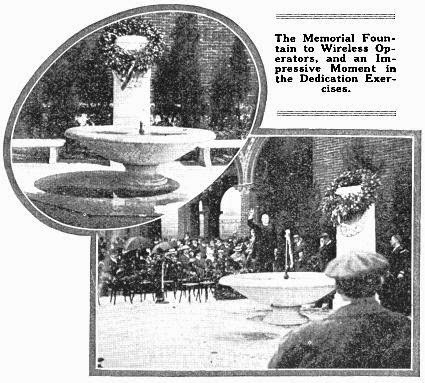 This bronze cenotaph and fountain was dedicated in 1915 to nine intrepid employees — “wireless heroes” — who died on the Titanic and in other ocean disasters. It had been removed from the park for many decades but has since been reinstalled between the park’s central lawn and the East Coast Memorial.